Albert Leverson James was the oldest son of a large family and worked in his father’s provisions business as a shop manager. He had joined the No-Conscription Fellowship at the outbreak of the war and was well known to other pacifists in the group. Albert’s experiences as a CO are marked by a complete refusal to give the military machine any kind of legitimacy and a refusal to compromise in the struggle against militarism. Albert was arrested on the 17th of November 1916 after his Tribunal hearing had ignored his appeal for exemption. Like many COs, he was expected to simply join the army as a rifleman. After not reporting to barracks, Albert was called before a Magistrates court, which he refused to attend. Many Absolutist COs would refuse to attend the Magistrates Court sessions in this way as they did not believe the Magistrates possessed the moral right to send them to the army. Unfortunately for Albert, this meant that he could be arrested by the Police and handed over to Kingston Barracks. Soon after, Albert was in trouble for refusing orders. COs would face Court Martial for refusing to pick up a weapon, obey orders to march or put on uniform. In Albert’s case he had refused to submit to the medical examination all soldiers had to go through. In this small way he showed his determination to resist all of the activities of the Army. By April, Albert’s illness had become so severe that his mother and sister were called to visit him in Wakefield. They revealed that he had been kept in an unheated cell and exposed to long periods outside in the snow and rain. He would die on Thursday, May the 17th. After Albert’s death, his friends and supporters put pressure on the Government to improve the conditions of Conscientious Objectors in prison. Albert’s death was raised in Parliament as an example of the Government’s disregard for men whose only “crime” was that they would not kill. 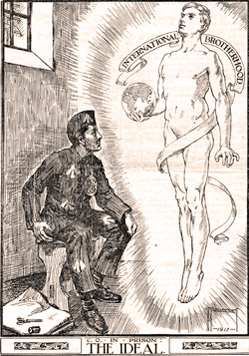 In the CO newspaper, The Tribunal, Albert’s obituary states that “his life was given to frustrating the ends of that militarism which destroys not only physical life, but the life of the nation’s soul”. Albert, along with many of the other COs that would die during the war, is commemorated on the CO Plaque. Their deaths show the nature of the civil and military system during the First World War - an indiscriminate force that can take the life of even those determined to have no part in it.